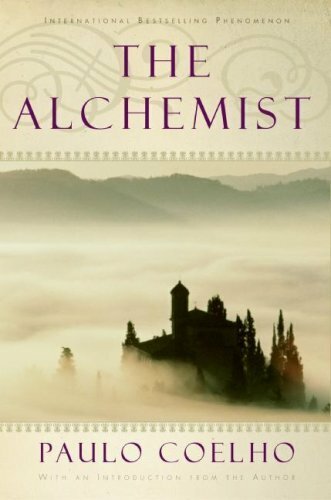 I had to read The Alchemist for a capstone class called “Life and Career Planning.” For that class, we’re not supposed to concentrate on things like symbolism or plot devices in the books we read; rather, we’re supposed to get the general idea of the book and explore how it can be applied to the class and our lives. Just about the one good thing I can say about the book is that it was a good one to start off the class: it’s about a boy following his dreams, and yes, it’s just about as corny as you would expect from that description. My biggest issue with the book was this: the prose was almost childish. Have you ever read a New Contemporary (or whatever) version of the Bible, where they take out all the “thee”s and “thou”s and “begat”s? That’s kind of what it sounded like to me, like a kid’s version of the Bible. It was a little hard for me to get past my dislike of the writing style enough to actually pay attention to the plot, but this is basically what I got out of it: Boy has a recurring dream about finding treasure in Egypt. Boy searches for treasure. Along the way, he meets lots of people who help him as he journeys toward his “Personal Legend,” including an alchemist. Finally (and I’m really not giving anything away here), he finds his treasure with the help of all these people…and God. Obviously, it’s a little more complicated than that, but it didn’t do much for me. As far as why it’s appropriate for the class and for my life…well, it’s about following your dreams, and the trials and tribulations you must surmount in order to achieve those dreams. Some might say, in regards to my dislike of the prose, that I’m kind of missing the point, which is that “simple things are the most valuable and only wise people appreciate them.” But I didn’t feel like this book was merely simple. I got the distinct impression throughout that it was talking down to me, and I didn’t like that. I did like the bit about the Personal Legend, and how there will always be people who help you along on the search for your Personal Legend, even if you don’t know that’s why they’re in your life. But I don’t think I’ve been changed by the book at all. My life hasn’t been made any better, my future hasn’t been made any clearer, and I don’t feel any more enriched—basically, I don’t think reading this book was part of my Personal Legend. You mean like having to read books like this one in order to graduate from college?